The Prime Minister of India, Mr Narendra Modi, launched the Swaccha Bharat Abhiyaan (the ‘Clean India’ Campaign) today. October 2 being Mahatma Gandhiji’s birth anniversary, I feel the mission has certainly commenced on a very auspicious day! The five-year campaign aims to make India even more beautiful through the collective efforts of the Government and the people; one and all taking initiative to make our dear Motherland a clean and charming place to live in! October 2 is a public holiday usually. This year, however, Mr Modi appealed to all the citizens to pay a tribute to Mahatma Gandhiji on the occasion of his 150th birth anniversary in the form of volunteering to clean their homes, neighbourhood, schools, colleges and offices. A Cleanliness Drive was organized in the Savitribai Phule Pune University to support the cause. The staff and students gathered in their respective Departments and lent a hand to beautifying the vast campus! So there we were, some of my classmates, juniors, professors and some members of the non-teaching staff and me, brooms and dustpans in hand! We swept the courtyard and the parking lot together, we uprooted the grass that had grown wildly by the front gate during the monsoon, and we swept the road too! It was back-breaking work, alright! Today, I’ve developed even more respect for all the sweepers and cleaners. Their job certainly isn’t easy! We had a lot of fun, what with the informal atmosphere between the staff and the students! We “scheduled” from one task to another and “dispatched jobs” to each other. There was “synchronization” and “efficient utilization of resources” (namely the brooms, dustpans and shearing scissors!). The premises cleaned, we hung up garlands made of marigold flowers by the front entrance, since the festival of Dussehra is to be celebrated tomorrow. We performed puja in the Office and in the lab, to honour the tools and equipments we use daily. 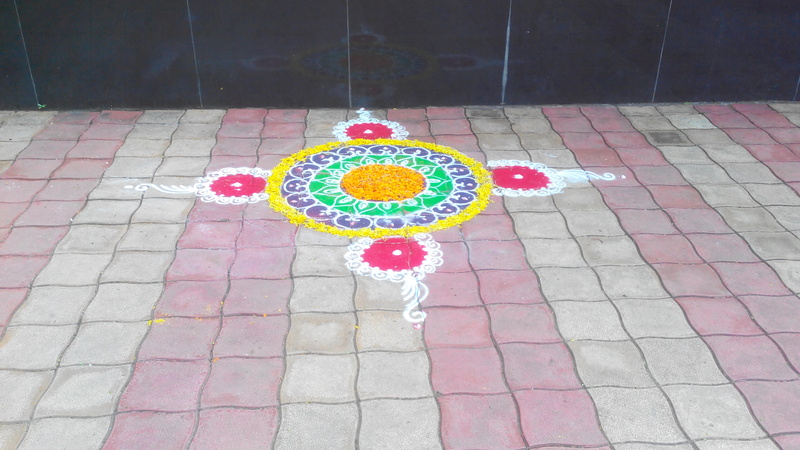 The girls currently in the First Year drew a beautiful rangoli, cleverly using some marigold petals and thus adding an eco-friendly touch to it! All work accomplished, we settled down to take in the picture. It certainly was a pretty one! Anything you toil and sweat for always does feel especially lovely! Besides, a clean environment refreshes the mind and improves the spirit! We all, in our own way, had lent a hand to beautifying the place we spend so much time at, our Department! It was a proud moment! We’ve taken that first step today. If we show as much spirit as we showed today, we’ll certainly get there pretty soon! Looking forward to living in an even more beautiful India! Next Next post: Following Your Own Path!